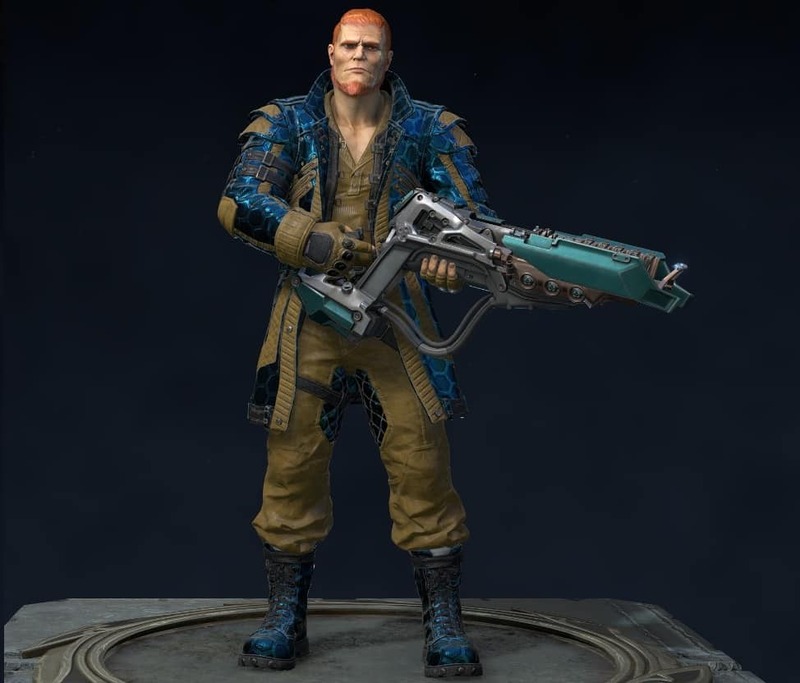 A short classification of the characters in Quake Champions – Who is the best for your style of play in the Quake Arena? Q: What is Quake Champions? 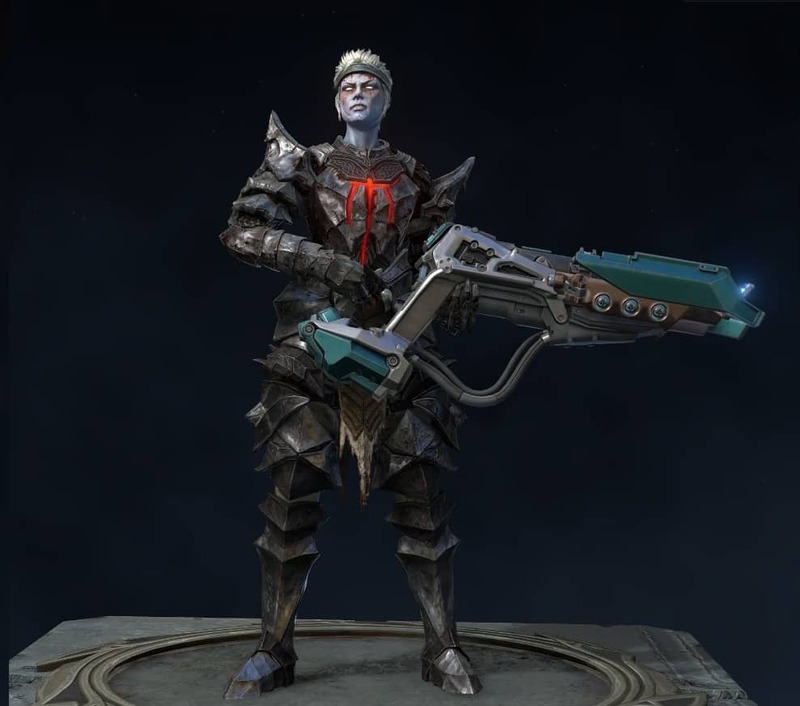 A: Quake Champions is a fast-paced first-person shooter (fps) game that is unique in its design and mechanics. 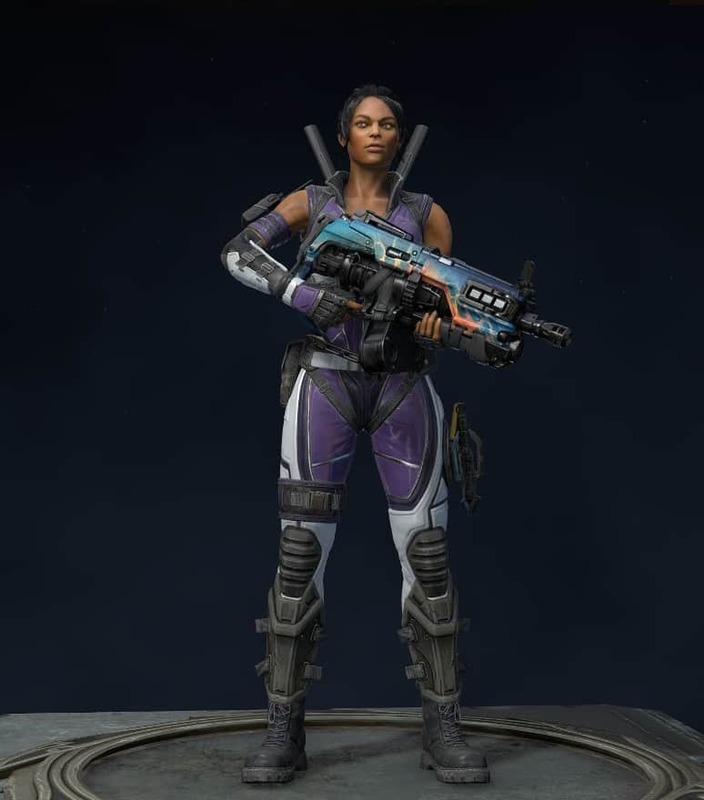 Unlike realistic FPS titles, Quake requires a slightly different mentality from the player to win. 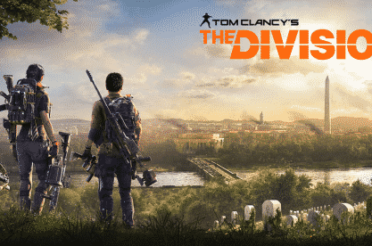 A mindeset more based on strategy and timing rather than precision aiming or clutch shooting, the Arena offers plenty of possibilities to finish 1st. Q: When is Quake Champions released? How much does it cost? A: Since 10th of August 2018, it has been free-to-play. Q: How do I get competitive at Quake Champions? A: Playing often, learning the game mechanics, and watching pro players. Muscle memory is key here. Q: How to download Quake Champions? 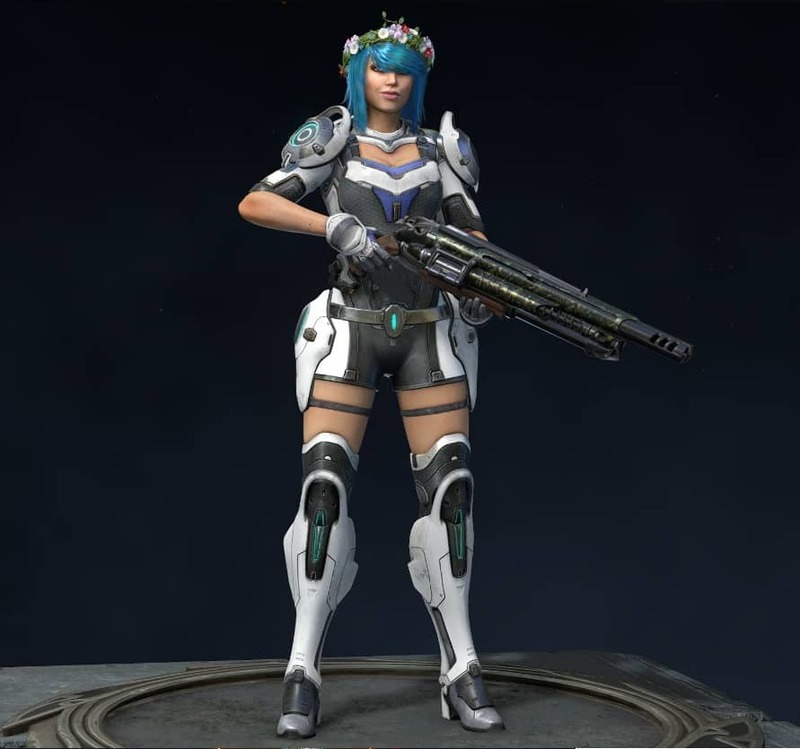 Q: How to become a Quake Champion by choosing the ideal character for me? What is your personal favorite? Share with us below! We’ll start with a classic — camping. All joking aside camping is somewhat frowned upon in the gaming community but take it from us, there’s no shame in disemboweling your enemies with the gauntlet from a camping position. Sure, you may catch some flak for this rather sly style of play but it’s a legitimate one regardless. Anyway, Nyx and Galena are the best characters for camping. Nyx dematerializes for a few seconds becoming invisible and untouchable. You can use this brief period to escape, get a better attack angle, ghost resources, or simply rematerialize INSIDE your opponent. Telefragging inflicts a glorious 125 damage points, and you can also jump on walls. 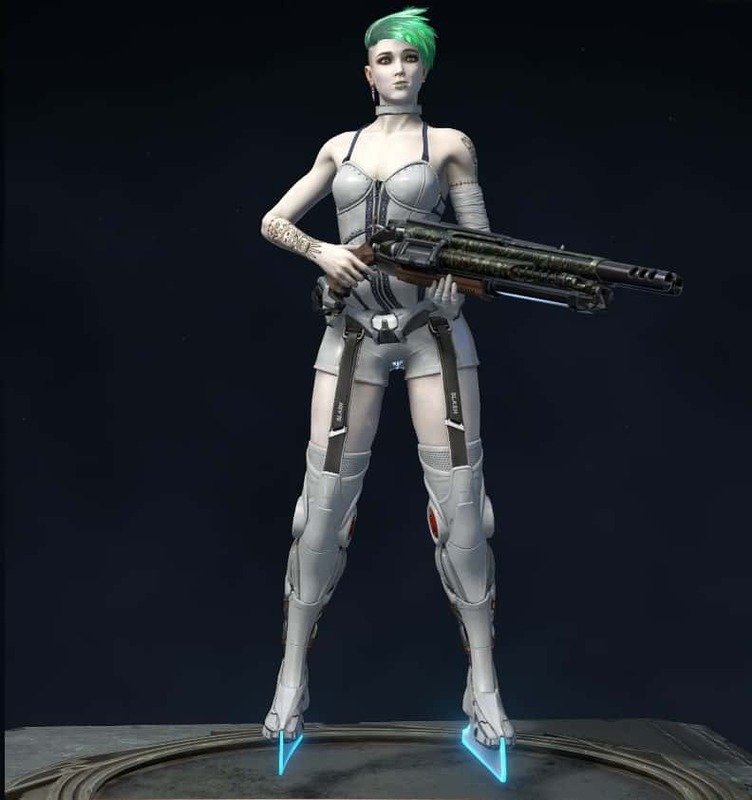 All in all Nyx is a very agile character, if you have more of a ‘flamboyant’ approach to FPSs then this will be an interesting character to try out. On the other hand, Galena is also great for camping, maybe not as static as Nyx, but adequate nonetheless. For example, Galena will deploy her Unholy Totem and can stick around to provide cover for teammates who are healing in the Totem’s proximity. Enemies unfortunate enough to step on it will receive up to 100 dmg points, enough to insta-kill. 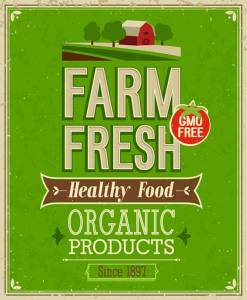 Also, a 5% boost to your cooldown is also given by picking up health. This class has one thing in common: the love for armor and ammo boxes. Eisen is a prime example of German efficiency, using a static turret that will cover your “arsch” a full 360 degrees. Eisen is also keen on camping, a style required by the symbiotic relationship between him and his beloved sentry turret. The captain can reduce his cooldown time by 20% (10 seconds) when collecting Heavy Armour and 10% (5 seconds) with Light Armour. 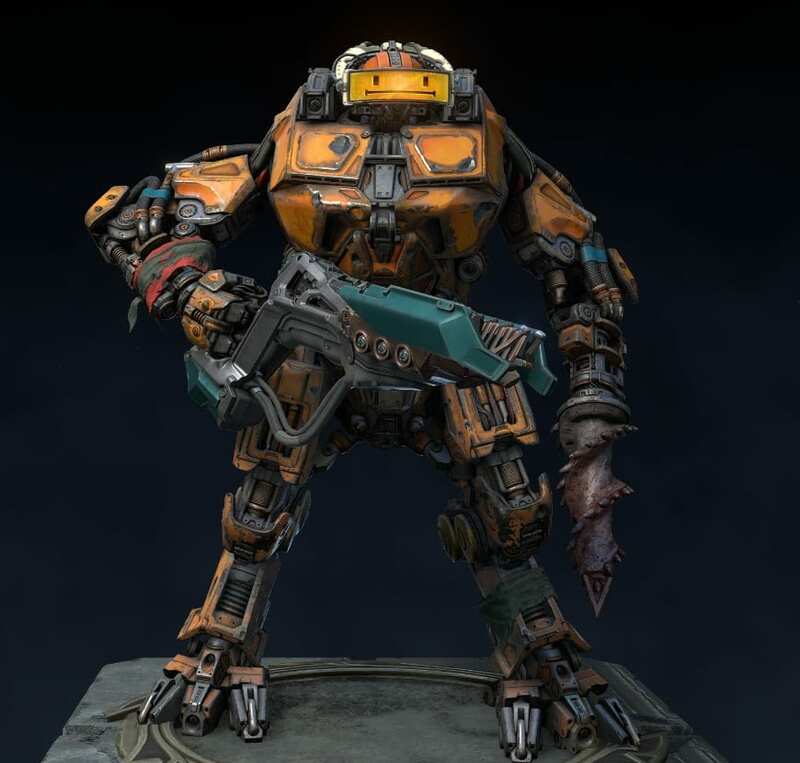 On the other hand, Keel is more of an offensive engineer which can lob up to 5 smart grenades consecutively. Each nade requires a cooldown of 9 seconds and has a 2-second fuse but also explodes on enemy contact. Stacking on ammo boxes reduces the cooldown time by 5% (2.5 seconds) each. Both the turrets and grenades can be used in a variety of offensive and defensive scenarios. 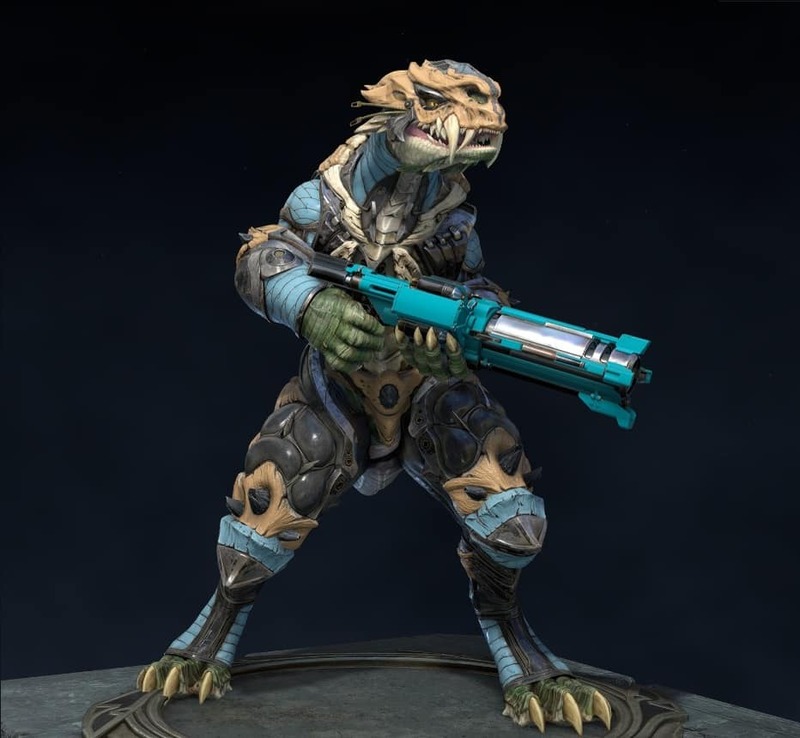 For, example Keel can use his grenades all at once as a preemptive strike or leave one or two on the ground while baiting an enemy player into a chase. Eisen can setup covering room angles and entrances, thus placing a turret in certain locations can isolate large areas. The heavy tanks are based on momentum, literally: momentum = mass x velocity. 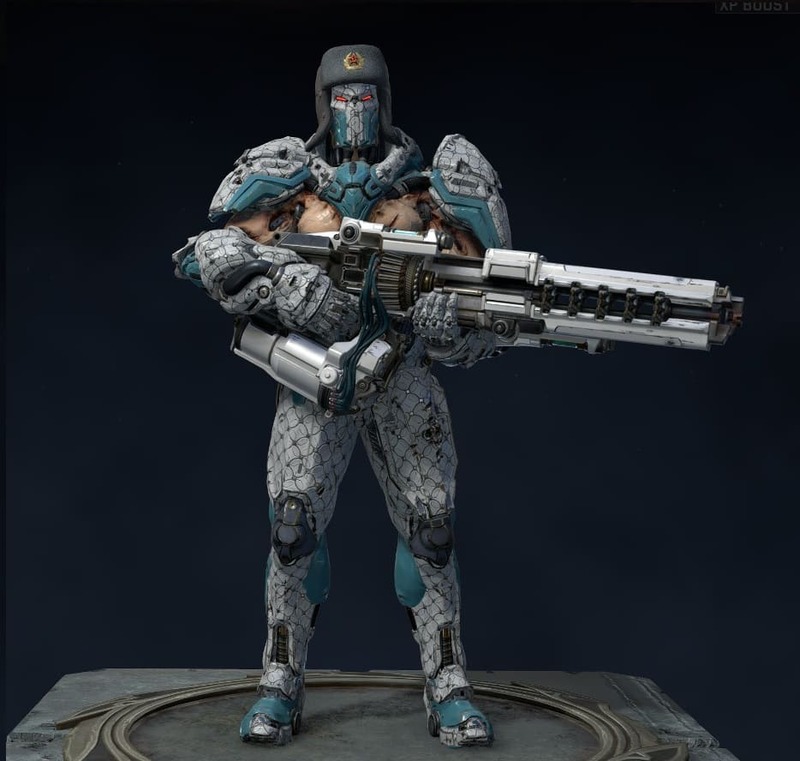 Both the Scalebearer and Sorlag are resistant, heavy characters, that can develop momentum through bunny-hop jumping. Q: How to bunny hop in Quake you wonder? A: Simply jump consecutively while moving forward. The better your timing, the faster you’ll go. The Scalebearer is best described as a sprinting brute force. You can tag multiple players and train-kill, jump on enemies’ heads, or use the jumping pad to eviscerate your foes vertically. Because of his incredible weight, once he gets past a top speed of over 400 units per second he can damage his opponents by hitting or crushing them. Of course, you can also use the skill to run away when hurt. Sorlag is not as heavy and can even prove pretty athletic and fast. His primary weapon is his toxic vomit which sticks to everything and does 10 dmg points per second and blinds enemies if spat on directly. It’s an incredibly versatile venomous spit that can be deployed directly on groups of enemies, in strategic area-denying locations, or even on the spawning point of a Quad. 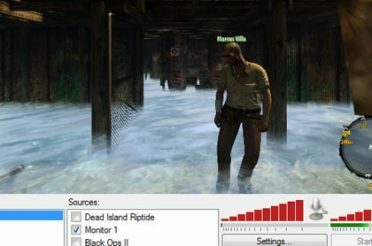 Using a machine gun on an infected player can chip away his entire health bar in a few seconds. Both characters are based on bunny hopping to acquire top speed. 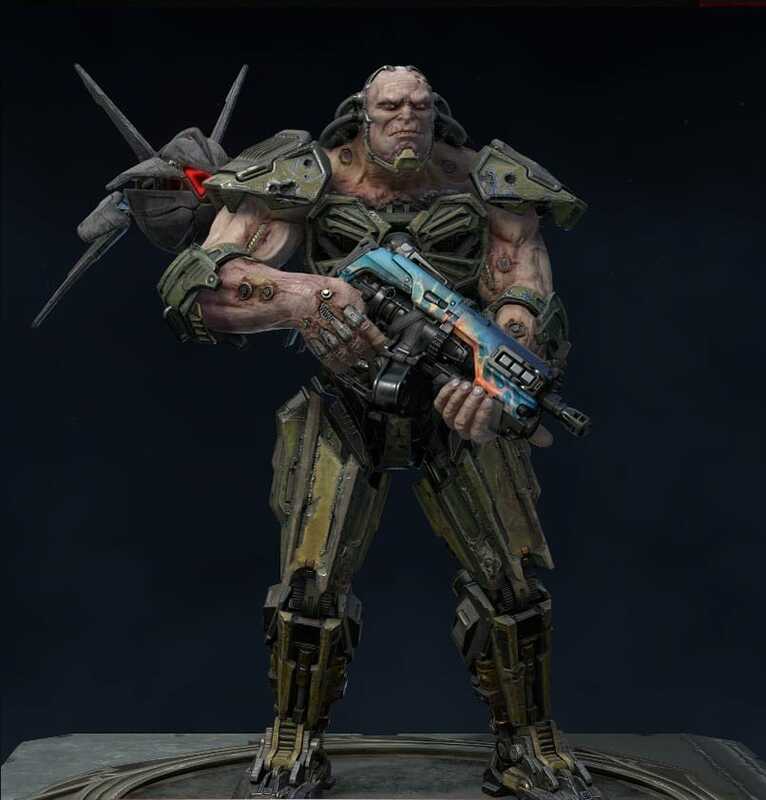 The Scalebearer is naturally more offensive than Sorlag, who has higher mid-air maneuverability. The two paladins are kind of half-tanks with specialized skills. They’re faster, but also less-resistant to attacks. Players will have to circle fights instead of diving in head first. B.J. 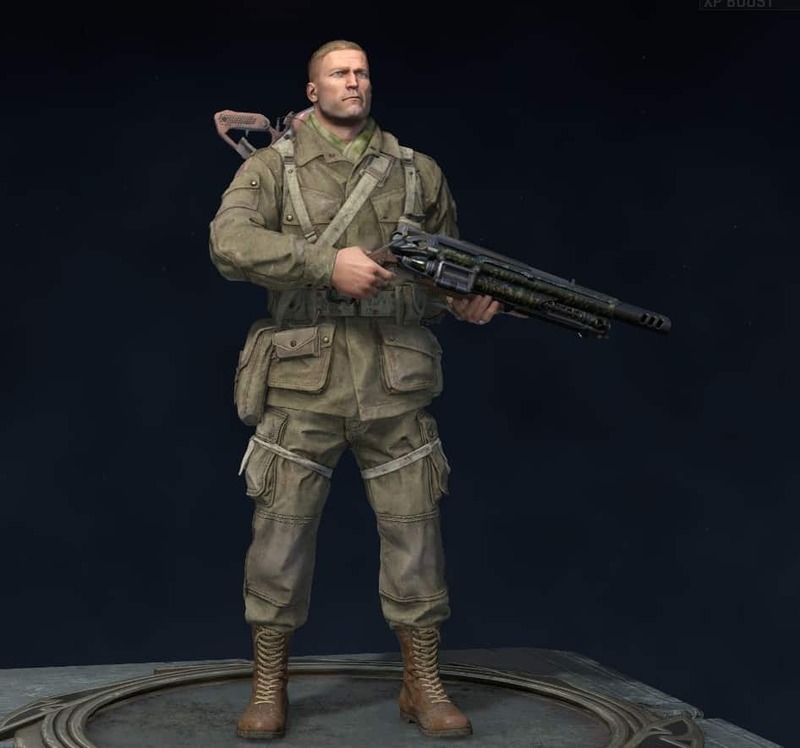 Blazkowicz can dual-wield for a couple of seconds. The Texas pistol draw is quick, the equipped weapon’s firing speed is boosted by 1.5 times (1.25 for the lightning gun), and Terror Billy can finally live up to his name. Not to mention that when out of battle, he regenerates his health for up to 25 points. 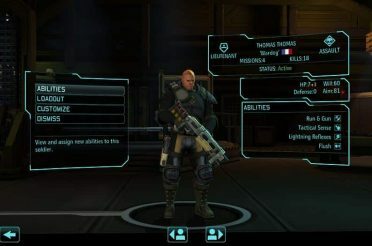 However, low health makes the character grunt loudly, giving away his position. 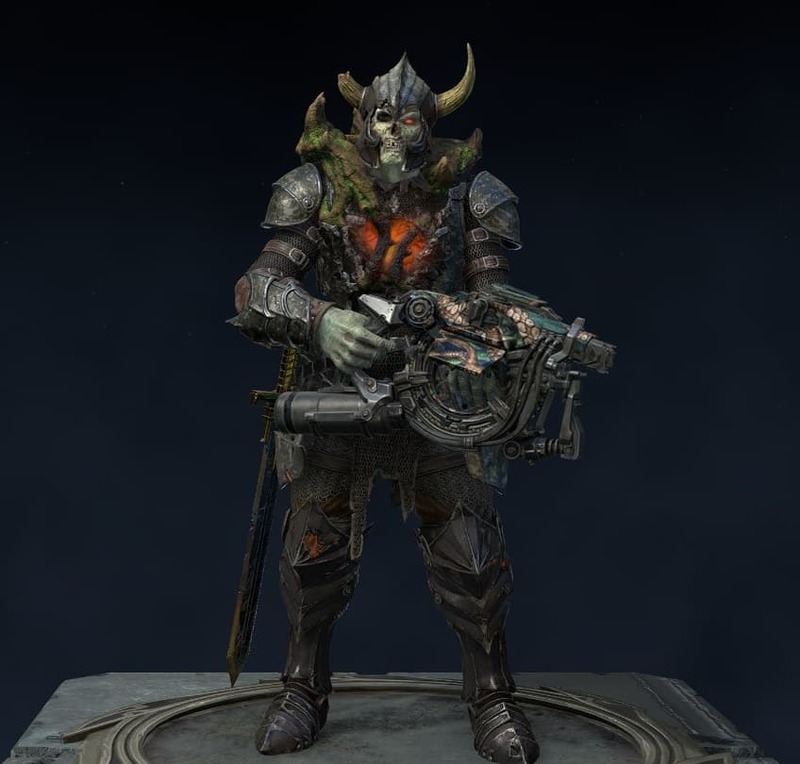 Death Knight haunts the dreams of his enemies by launching three fireballs from a sword-like motion that can either explode on impact or in mid-air, leaving a sticky hell-fire that causes continuous damage. His fire does not affect him and adds burning fire damage to each melee attack. Billy can reach incredible levels of damage by securing the Quad and double wielding: quad x 1.5 = six times the damage! The Dead Knight employs almost the same tactics as Sorlag with his vomit. However, the sword-slash up close make the fireballs nukes, dealing massive damage to enemies, often killing in one blow. Although maybe the antithesis of another, Billy and the Death Knight are true paladins — or necromancers, respectively. 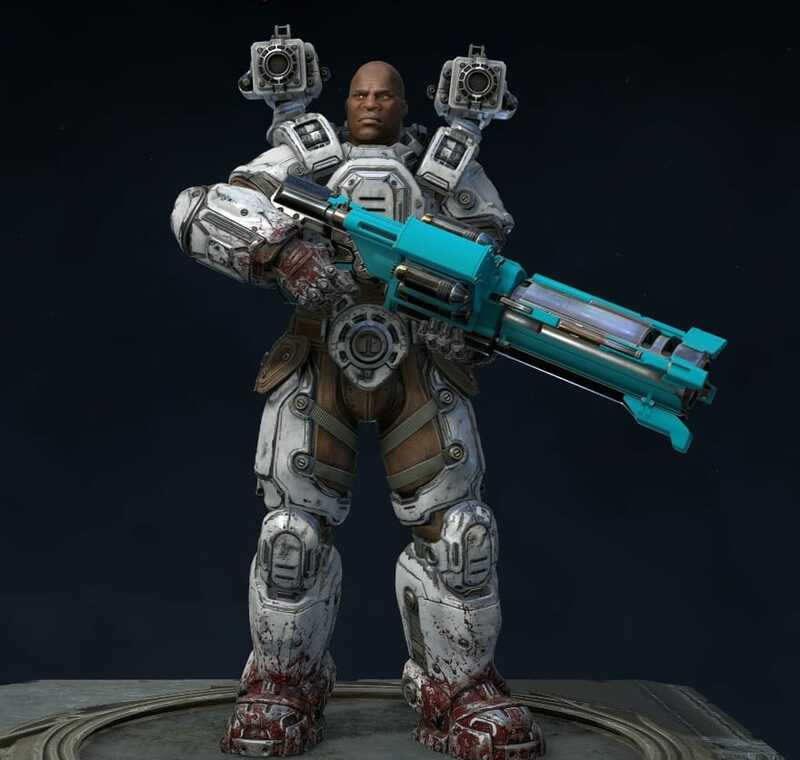 Doom Slayer is the most athletic character in the whole game and the most silent, concealing his map presence at all times. Double jumping and boxing his way out of hordes of demons like it’s nothing. His berserker mode adds speed and turns everything into a pulp with his fists, he even “locks-in” to targets from mid-air and delivers super-man punches. 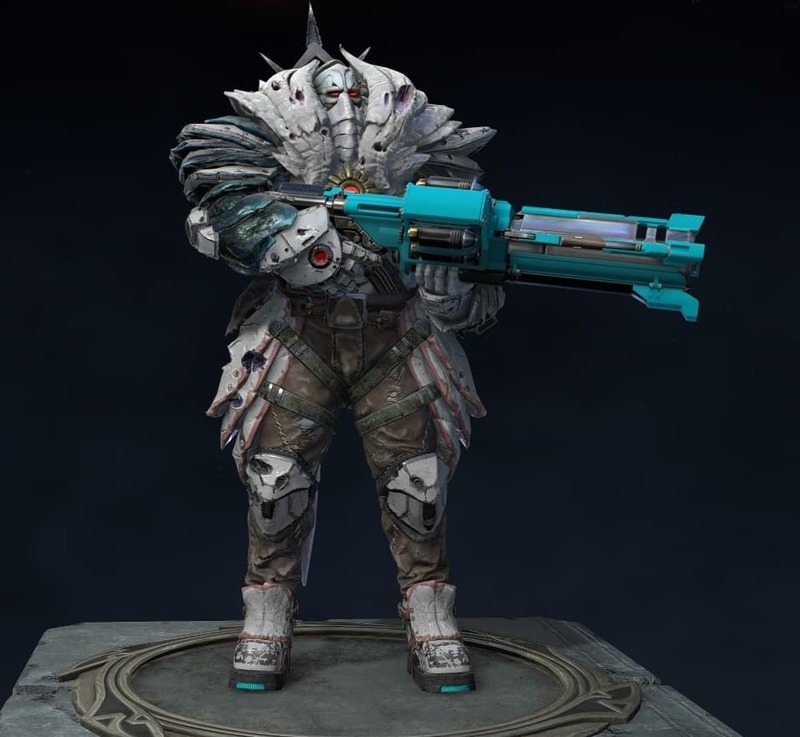 Visor is probably the most ironic character of Quake Champions. Majority of his masks have no eye-holes, he speaks unintelligible Russian, but he sees through walls for a couple of good seconds. 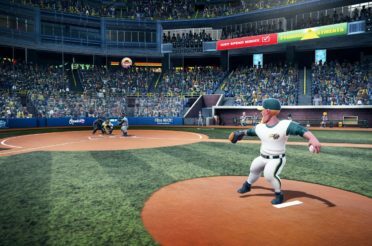 He’s extremely athletic, with the highest air acceleration in the game. His Piercing Sight allows him to see everyone, including Nyx and Peeker. Also, strafe-jumping is his specialty. Q: How to strafe-jump in Quake you wonder? A: You have the press W and then bunny-hop jump once on a foot and once on the other. Meaning pressing A and concomitantly (pivoting) turning the mouse to the left, and then on the next consecutive jump, pressing D and concomitantly turning the mouse to the right. Sort of like an alternate lateral skipping. More like the opposite of Eisen who represents German technology, Visor represents the Russian technology that works perfectly even though nobody knows how. Visor is effectively used with team talk and is maybe the best sniper character. Slash is a real punk girl, flipping her enemies everytime she starts leaving her explosive skate trail behind her. This character is speedy and can even perform crouch slides when landing. An ability that gives her a 1.2x speed boost and can be used to escape foes, secure resources, or attack other players by circling them with the plasma trail. Her low health and armor rate make her quite fragile, so be sure to slalom out of danger and anticipate your opponent’s movements. 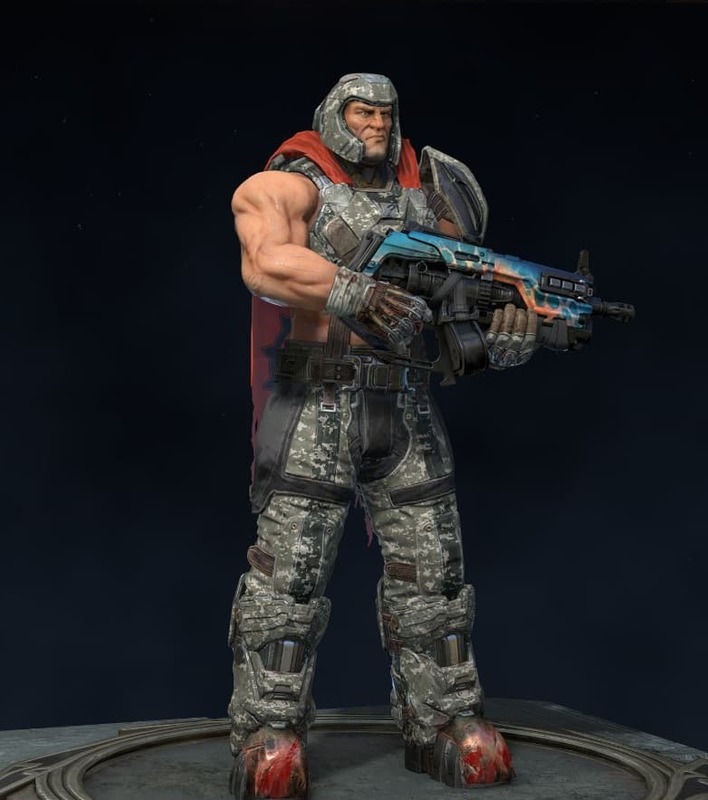 Ranger is the ultimate Quake veteran. 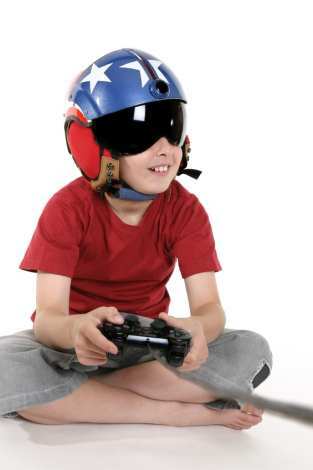 He’s been telefragging his adversaries since the beginning. His Dire Orb can be launched in every angle of the arena. However, if Ranger teleports into another player, that player will explode in pure gore. Also, the Orb can be used as an antipersonnel mine with 50 points of damage. Known as the Son of a Gun, Ranger takes 75% less damage from his own friendly fire, so rocket launch yourself all you want. Both characters can develop infinite strategies due to their quickness and spatial control. Ranger can leave a Dire Orb on various resource spawning points, count the 30-second spawning time, and just teleport there. While Slash can deny the access through portals, the use of jump pads, and even block more than two arena entrances. Athena uses three hooks to pull and swing herself from all corners of the Quake Arena. She reaches points of the map inaccessible to the majority of the characters. By consecutively using all three of her hooks, Athena can achieve incredible altitudes and hang time over unsuspecting foes. She can grip herself even to enemy players and hit them with a total of 50 damage points. Low on health? Just pull yourself to a health bubble and get there instantly. Strogg & Peeker are one hell of a duo. It is one of Strogg’s foremost abilities is to switch into highly camouflaged state (camping, lol) and deploy his drone, Peeker, who can fly around and shoot at enemies. Peeker can turn kamikaze and will plunge into its enemies inflicting high proximity damage. 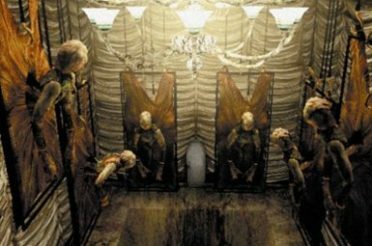 Strogg also replenishes his life using the Stroyent capsules from the corpses of his victims. Best used with team talk, both champions are great for scouting. Athena can perform impressive maneuvers in mid-air and rain rockets on her unsuspecting foes or escape unfavorable situations. Strogg has a flying BFF drone who’ll die for him. Get the Quad, and the drone becomes a battlecruiser. 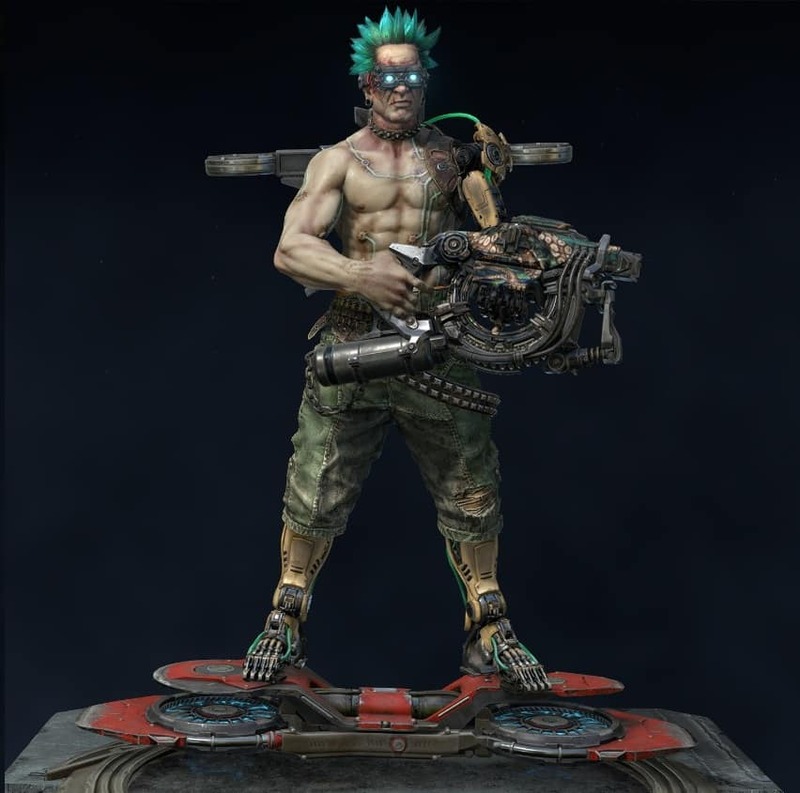 Anarki skates, gets high, and is usually a chill dude. Unexpectedly, he’s built for the long-run — infinite run, being a transhumanist punk and everything. He’s one of the fastest characters in-game and can replenish all his life plus one point by injecting an unknown substance. Basically, a second life — crazy visuals are also included when doing so. More so, the Transhuman Punk can control his hoverboard in mid-air, cutting corners and zig-zag dodge, making him one of the hardest Quake hitboxes to shoot. Clutch is also a tank, but the impenetrable shield he draws for 5 seconds puts him in a special place. 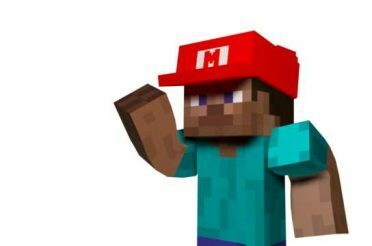 He can dash in mid-air by double tapping, reaches great unidirectional top-speed, and can even ditch the shield for his mining laser which does 80 dmg points a second. However, both his shield and laser gun share a five-second limit and can’t be used at the same time. The good part is that in Quake, five seconds is a lifetime. The extremely wide frontal tactical shield offers infinite tactical potential. Used in cohesion with at least another teammate can create a perfect bait-and-kill situation. 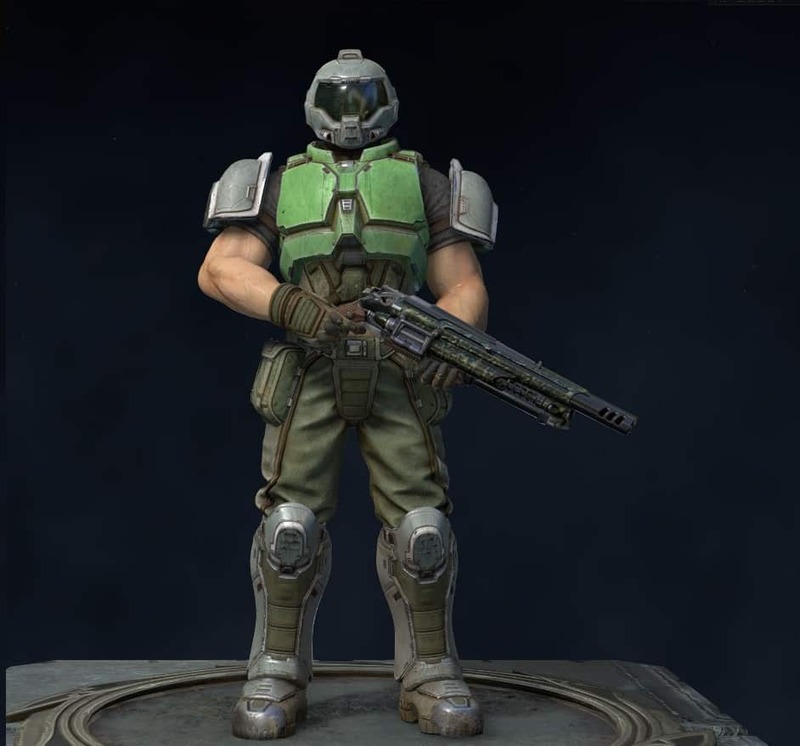 A: Doomguy or Doomslayer, is a famous ID character from the DOOM series who makes a comeback as one of the most powerful and athletic players in the game. He’s a pretty straight-forward character, very easy to get used to. His double jumping ability allows him to reach high spots or dodge attacks in mid-air. The Berserker mode will turn you into the greatest boxer of all time. Also, he’s the silent type, you won’t hear a single Grunt from him. According to John Romero, the original character designer said that Doomguy represents “the player itself”. Standing tall at 72 inches (1.83 meters) and weighing 180 lbs (81 kilograms), this Marine represents YOU. He’s also appeared in games such as Saturn version of Quake, DOOM, Quake III Arena, Rage, and even Tony Hawk’s Pro Skater 3 as a secret skater. He has surely become a contemporary icon. Q: Does Quake Champions offer Bots? A: Bots are available for custom matches since the August 2018 update. However, you’ll need to buy the $46 (€40) Champions Pack to get access to Custom Games. Also, the custom games with bots only work with an internet connection, unfortunately. There’s also a free multiplayer mode in which humans go against AI bots. Quake Champions is more than an e-sport, it’s an artistic masterpiece. You don’t have to experience it hard as “rocket science” while getting good at it and follow my advice about the characters above. Just have fun and think outside the box. 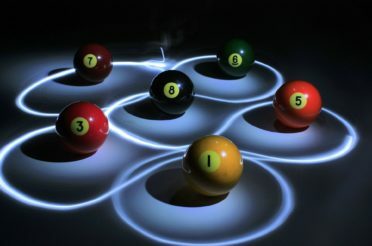 Practice a ton, observe other players for inspiration, and create your own strategies.